Perfection on Every Turn . . .
AFFCO has the largest capacity machine shop in the interior northwest. 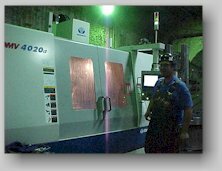 The machine shop and the facility's remarkable craftsman, both complement our foundry and fabrication facility as well as perform complete individual machining works for a variety of customers. AFFCO's machine shop has complete facilities for turning, boring, shaping, planing, milling, and drilling. Gearboxes for conveyors, kiln drives, etc.